How does the Bollinger band work ? Developed by John Bollinger in 1980, Bollinger Bands are a technical analysis tool for trading stocks. The bands basically are volatility bands (indicators) that measure the relatively high or low of a security’s price in relation to previous trades. This Volatility or up and down movement of the bands is measured using standard deviation. Thus it changes with increases or decreases in volatility. Also, The bands automatically widen with a price increase and narrow with a price decrease. This dynamic nature of the Bollinger Bands makes them suitable for the trading of various securities with standard settings. These bands are calculated based on the standard deviations of the particular stock’s movements and the previous day’s closings. 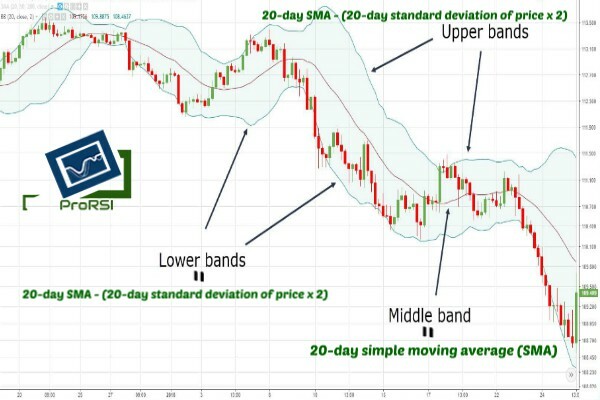 The middle band is a simple moving average calculated based on a set of 20 periods. The outer bands are usually calculated with 2 standard deviations above and below the middle band. Along with all these, one very important aspect to keep in mind for any trader is to decide the entry and exit timings. Let it be any indicator or strategy is important to calculate and understand when to invest one’s money and when to withdraw for maximum profit. on the Open the day after a stock closes below the lower Bollinger Band. In spite of ease of use and good trading results, one must remember that Bollinger Bands are primarily reactive, not predictive. The bands will react to changes in price movements, either up trends or down trends, but will not predict prices. Thus one must decide on the future of the stocks based on the present scenario. Thus keeping in mind other related factors is important while deciding.